To this day, the above lines from The Odyssey remain my favorite – I imagine Polyphemus’ fellow Cyclopes making the crazy sign, each rolling a singular eye – hilarious! But, what does this have to do with a hashcapade? Simple. 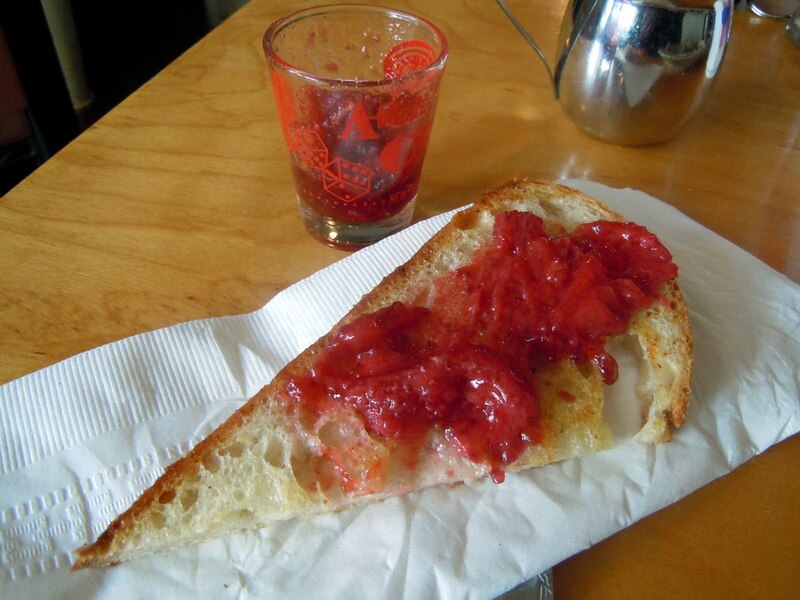 I recently finished reading Palmento: A Sicilian Wine Odyssey by Robert V. Camuto and connected Arleta Library Bakery & Cafe, which serves Sicilian Hash! So, the alignment of Homer, Camuto and Arleta for a hashcapade was preordained! 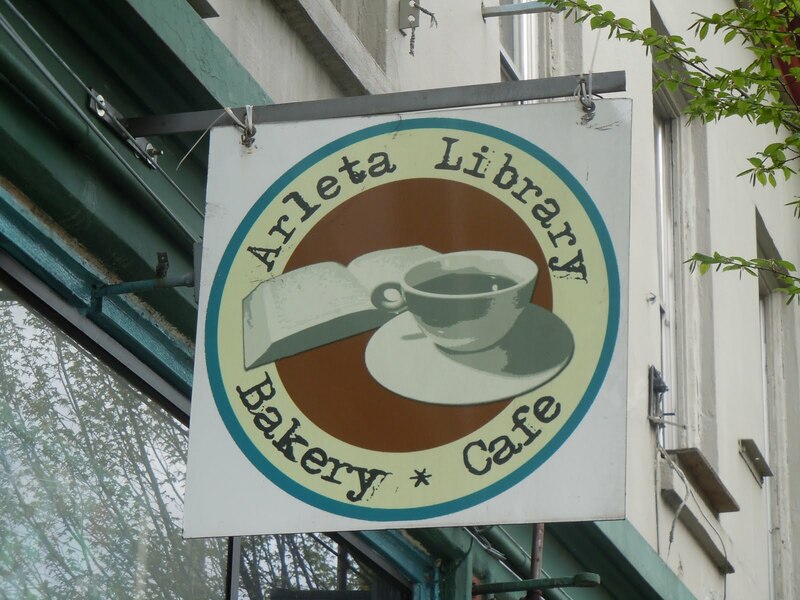 Connor and I arrived right when Arleta opened, 8:30AM, and were seated right away. 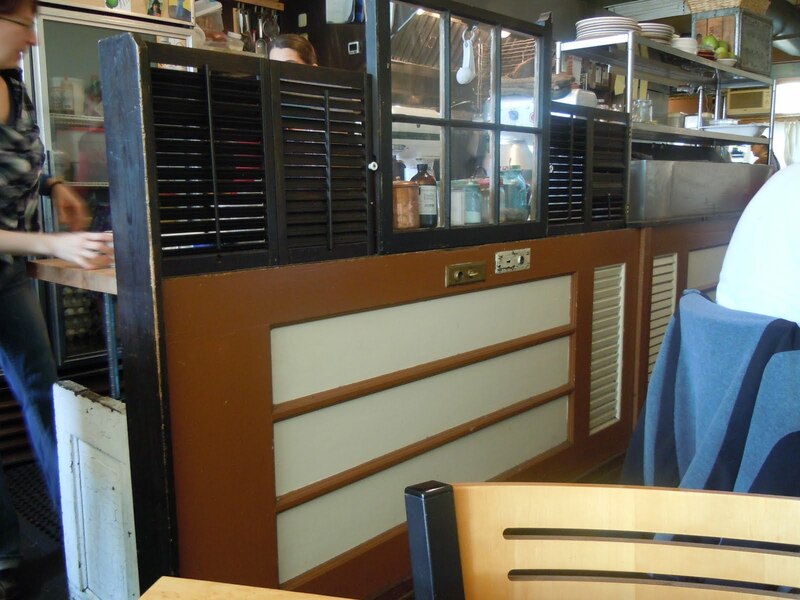 Soaking in the ambiance, I noted the use of recycled doors to separate the dining area from the kitchen, just as Paul mentions in Breakfast in Bridgetown. The sun was streaming in the east facing window, giving the cafe a lovely warmth and charm. While Jem or similar music was playing in the background, my cup of joe, decorated with a butterfly, arrived. Butterflies, and zebras and moonbeams and fairy tales – this hashcapade was about to take wing! 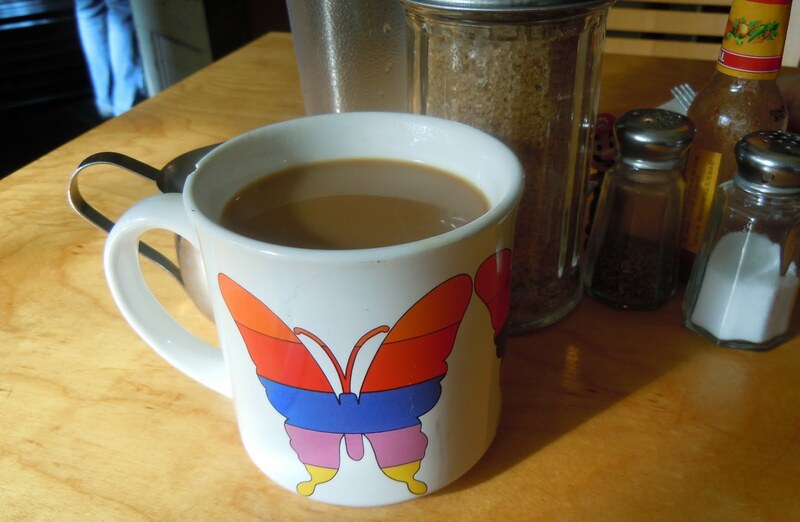 My butterfly mug – I’m going to request each time I return! Finally, as if this hashcapade could get any better, I discovered on-line that Arleta owners, Nick and Sarah Iannarone, were featured on FoodNetwork’s Diners, Drive-ins and Dives. On the episode, Biscuits, Bagels and BLT’s, they made the hash and the recipe is online – WOOT! Fresh on the heels of an Indian and Oaxacan hashcapade, it only seems fitting that the equally exotic cuisine of North Africa – Tunisia, Algeria, Morocco – be my next target. And, just as India has curry and Oaxaca has mole, North Africa boasts a signature ingredient, harissa. Put another way, harissa is to North Africa as salsa is to Mexico. Its pepper, garlic, coriander, chili powder and other spices amp up any dish considerably. My starting point was going to involve harissa, potato, chicken and okra, but as I looked at different recipes, it became clear that I *had* to go with lamb and ditch the okra in favor of chickpeas. I also thought the food ring needed a different treatment, but what? 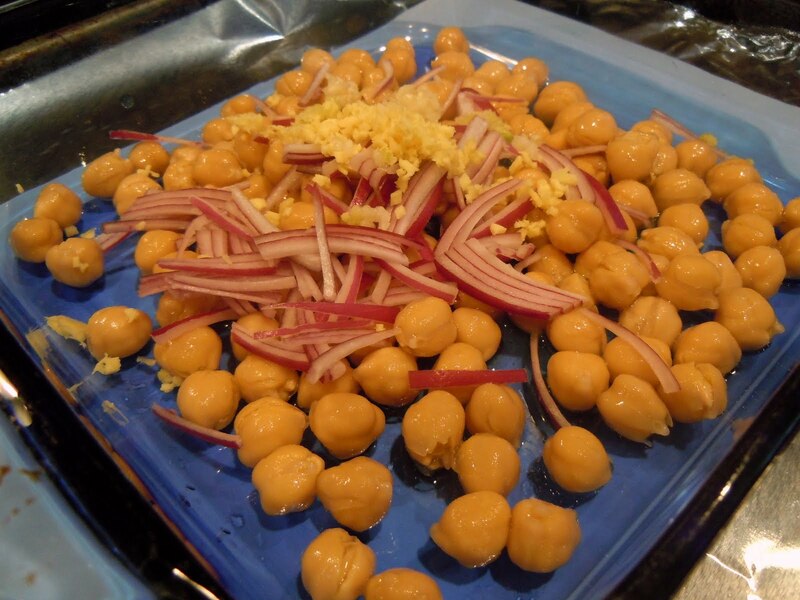 Chickpeas, red onion, garlic and ginger await roasting. 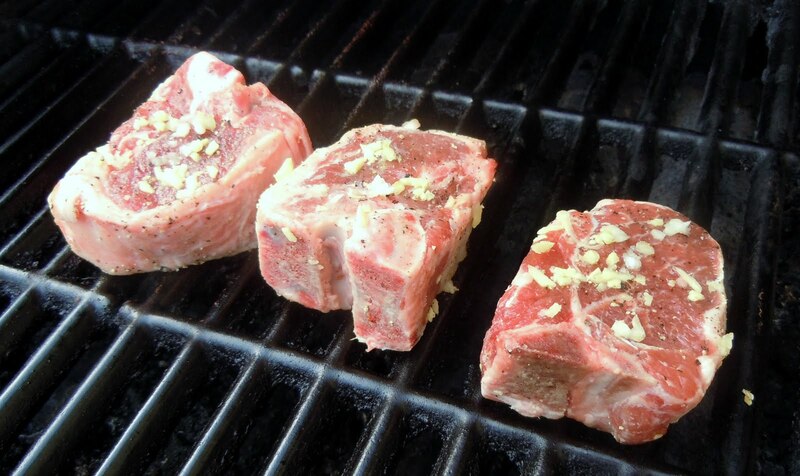 Lamb loin chops – like little lamb T-bones! Anyway, with the layer concept established, I set about grilling lamb loin chops, which the butcher characterized as little lamb T-bones. Secretly, his apt description made me giggle when I threw them on the grill – soooo tiny and cute! Next steps were roasting the chickpeas, making a shredded carrot, feta and mint salad with harissa and mixing some diced cucumbers with Greek yogurt. 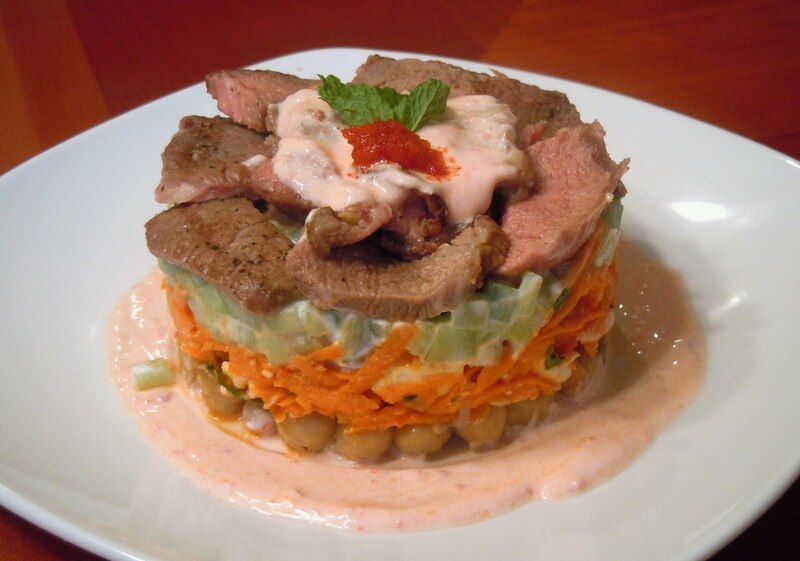 For the plating sauce, I used harissa and the Greek yogurt – naturally! This hashcapade was wicked tasty, full of exotic flavors, thanks to the harissa. 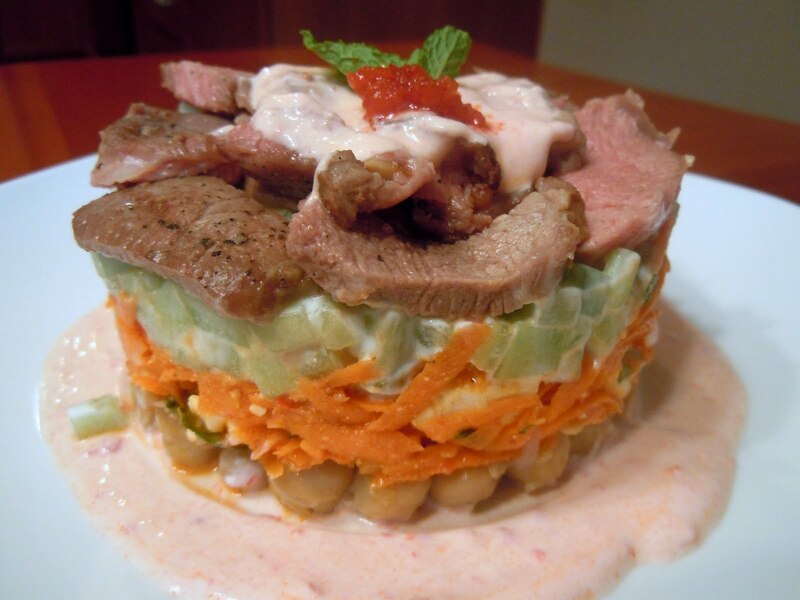 Succulent lamb, crunchy cucumbers and carrots paired with the roasted chickpeas created a fabulous texture. I couldn’t stop eating and literally inhaling the hash! Contemplating the cornucopia of veggies, it occurred to me that you could leave off the lamb and still walk away with a food coma! Oh, and don’t forget your milkshake! Before you go ga-ga over the harissa, preheat the oven to 425 degrees and get the grill going! > Mix all of the above in a small baking dish and roast at 425 for 15 minutes, remove, stir and set aside. > Using a 4″ diameter, 2″ high food ring, carefully pack one layer of the chickpeas, then an equal thickness of carrot, then an equal layer of cucumber. NOTE: Makes 1 serving with my 2 inch high, 4 inch diameter food ring. 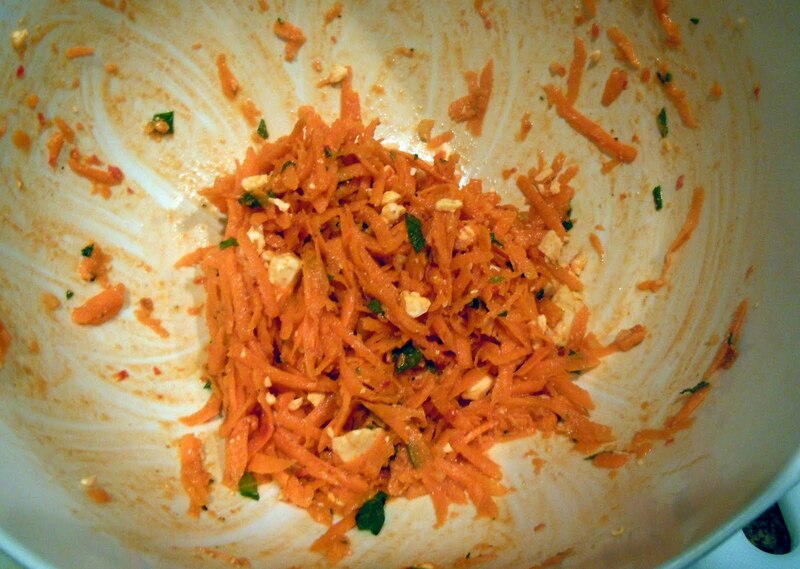 You will have leftover carrot salad and chickpeas – combine for a leftover salad snack! I’m a little nervous. How do I capture the essence of my hometown in a hashcapade? Is it possible? The answer is illusory at best as I think about my formative years spent in Casper, Wyoming. 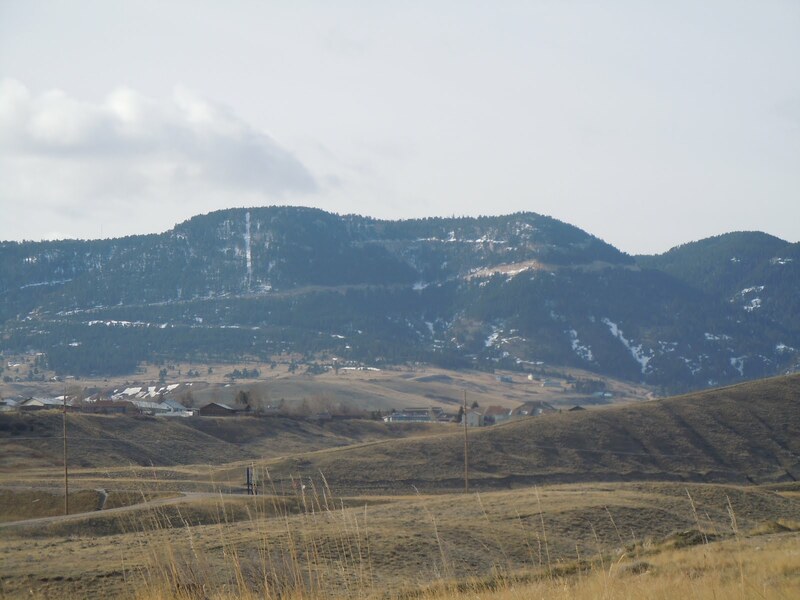 But then, the panorama behind my childhood home gently reminds me, symbolizing the spirit of my youth – Casper Mountain. I spent hour upon hour in the prairie at its base riding bikes, catching horny-toads, hiking, chasing antelope (no contest there) and imagining my future. The mountain served as a landmark, protector and endless source of recreation. So, on a gorgeous and sunny morning, my vantage from the North Platte River looking back towards the mountain was even more expansive. I started my 10-mile run with a sense of nostalgia and focus to get my pace right at a mile+ gain in altitude from Portland. Then it hit me. I have always been connected to Oregon! Hello – the Oregon Trail passed right along the North Platte, just north of Casper, and eventually showed pioneers the the rich, fertile Willamette valley! I felt a connection to these hardy souls as I continued my run across town and back. What other touchstone would reveal itself? 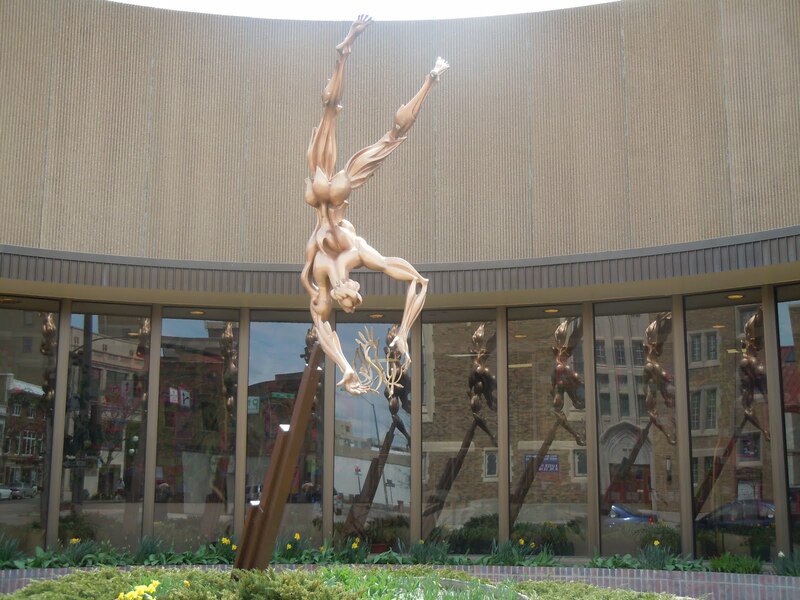 Refreshed and famished after my run, my twin sister and I drove through downtown, passing another iconic symbol – Prometheus. To me, the fire Prometheus brought to mankind from the Gods represents light and wisdom brought to the middle of Wyoming! Oil, coal, natural gas, uranium, wind, and sun are abundant and bring professionals of all backgrounds to places like Casper. Our credo hearkens back to a pioneer culture, a cowboy culture and a wildcat oilfield culture – entrepreneurial, rugged, grounded and fiercely independent. And so here I was in a post-run glow, soaking up the sun, Casper Mountain, Prometheus and the city I left 27 years ago. Mari, Alex, Rachel and I were meeting for my first hashcapade in Casper at a restaurant called Eggintons. Would my hometown hashcapade deliver the goods? Delicious, spicy sausage and hash brown potatoes topped with eggs answered emphatically – YES! Following my last exotic Indian hashcapde at Chez Clark, it only seemed fitting to stay in the exotic vein, pushing the boundary to explore the art of hash. 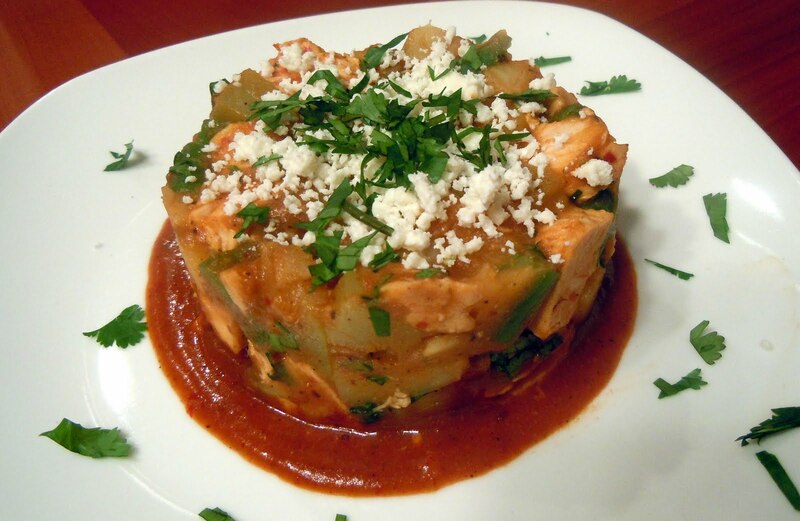 So, I channeled an Oaxacan cooking class from Sur la Table to create a flavorful, spicy and veggie-packed dish. One of Oaxaca’s culinary traditions is mole (pronounced MOH-lay), which simply means sauce. Just as the French have multiple types, so do Oaxacans – black, brown yellow, brick, red, etc. A defining characteristic is the time-consuming preparation – charring ingredients and spices – soaking chiles – blending till silky smooth. 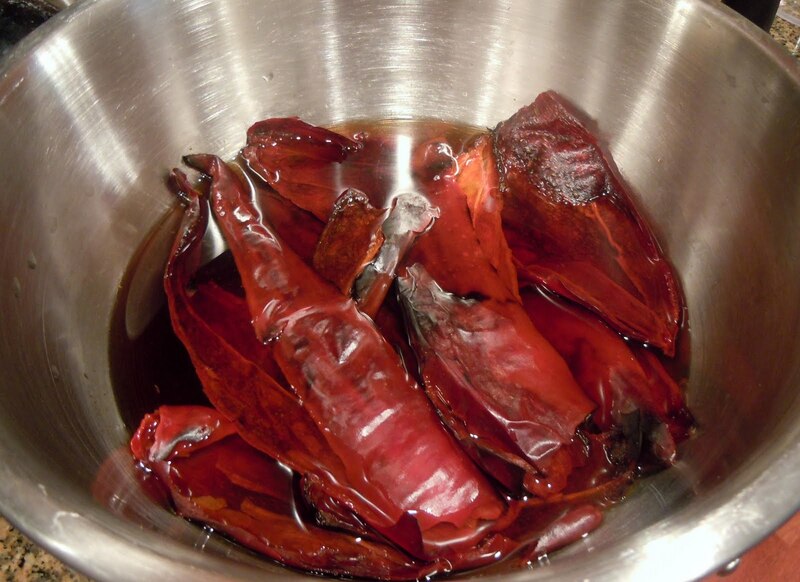 And as far as ingredients go, chiles anchor a mole, like these charred guajillo chiles soaking in hot water. 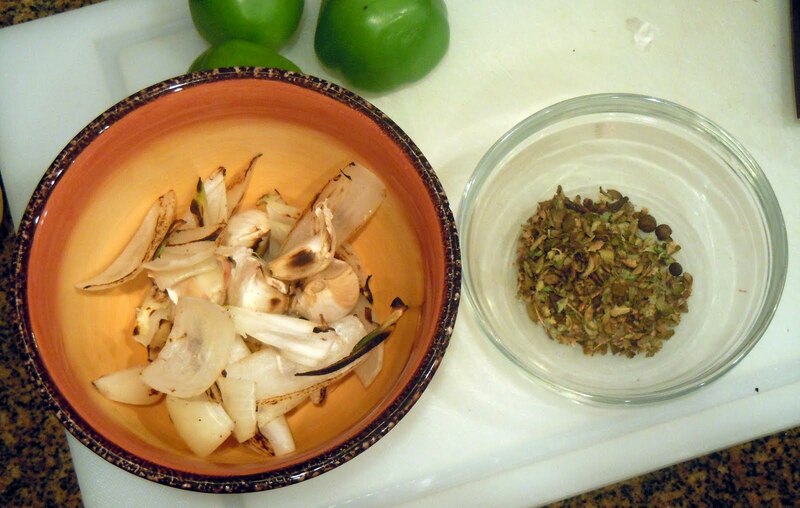 Oaxacan cooking involves charring the ingredients for moles. Charred Guajillo chiles soaking in water. Important lessons I’ve learned, having made this dish (not hash style) multiple times are to: 1) use guajillo chiles, 2) use masa or corn flour for the thickener, and 3) allow plenty of time. I once substituted dried New Mexico chiles and created a mole so spicy, it made Secret Aardvark Sauce seem tame by comparison! 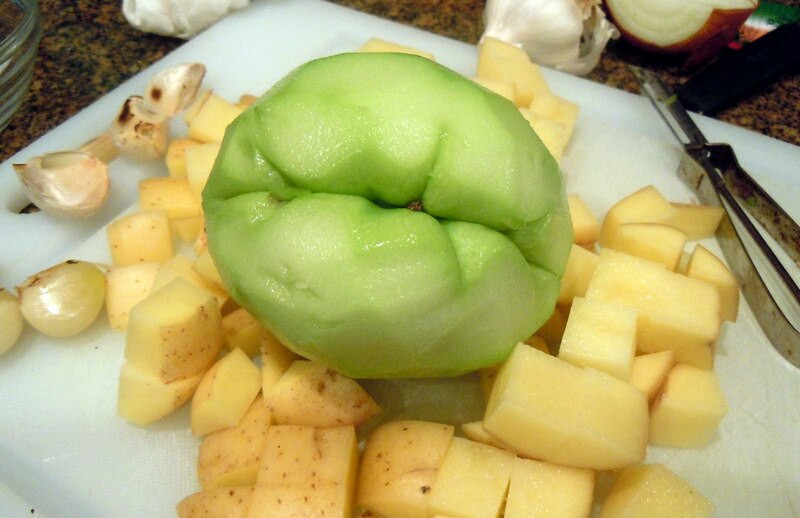 The new lesson I learned on this hashcapade is that chayote (pronounced chai-YO-tay) is a dangerous man-eating vegetable, almost bit off my arm! Fortunately, I have mad ninja skills and put it in its place, sulking with the potatoes on the cutting board. 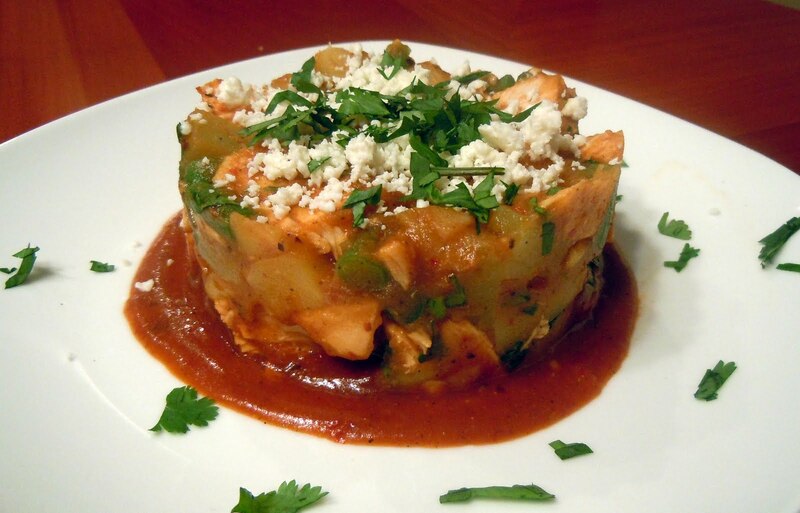 Actually, you’ll be impressed with the texture and luscious goodness of chayote. In fact, I’m going to follow the Wikipedia reference above and drive some julienned in lime juice for a salad sometime – yum! Ever been to Oaxaca? Tell me about it! 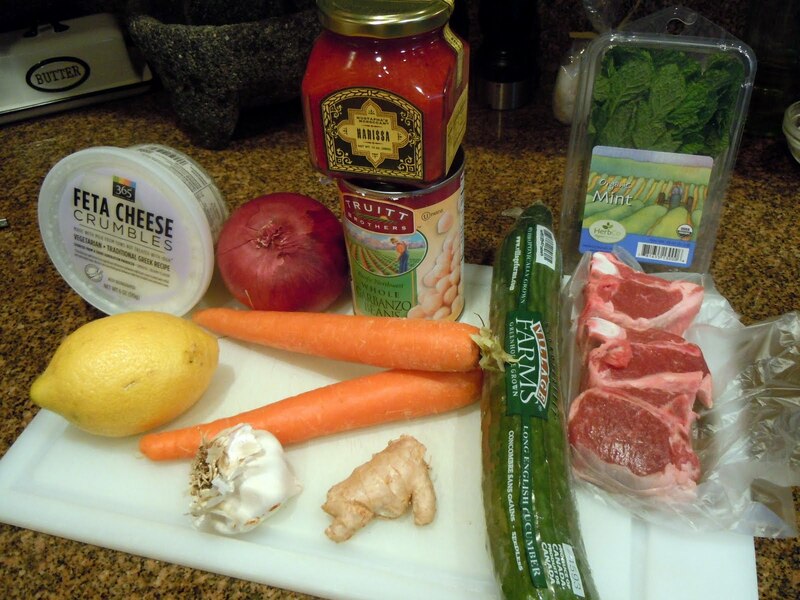 The sequencing of this is set out below to minimize time by doing steps in parallel and reusing boiled stock. I’ll try to call out what’s going on when. > Potatoes and chaoyote should be tender, but not mushy. Beans should be firm, not soft. 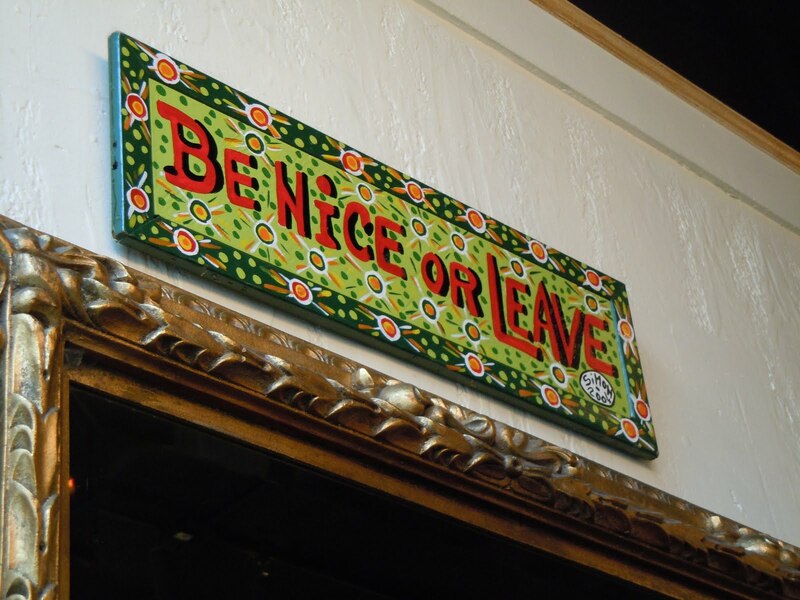 Be Nice or Leave! That’s what the sign above the hostess station at Mother’s Bistro read. I reckon that’s how a mother would scold her kids, akin to: “If you can’t say anything nice, don’t say anything at all.” Perhaps it reminds people to be patient because the wait for this iconic restaurant can be considerable. Fortunately, we had arrived early and helped form an orderly, if not under-caffeinated queue on a quiet Sunday morning. My friends, Cory, Mary, their son, Jesse, Doug, Connor and I were about to have the comfort food to end all comfort foods! But, before I dive further into this hashcapade, I must set the context. The night before, I had attended Michael Pollan’s lecture at the University of Portland with about 4000 other like-minded people. We were entranced by his simple dialogue on nutritionism, a “religious” belief system that has separated us from our cultural knowledge of food and interposed experts – scientists, dietitians and nutritionists – between us and our food. He also noted that a culture’s food anchor is Mom or Grandma (Nonna). So, newly recharged and thankful for my Mom’s “granola period” in the 70’s, this Mother’s Bistro hashcapade can continue in perfect congruence with Pollan’s simple advice! No, this is not Michael Pollan! Browsing Mother’s menu, is like consulting a holy work – awe-inspiring, yet daunting – and physically intimidating with its big, green, and solid binder with multiple chapters, and dense, yet simple culinary prose. Our high-priest, er, waiter guided us as we each selected the perfect choice. 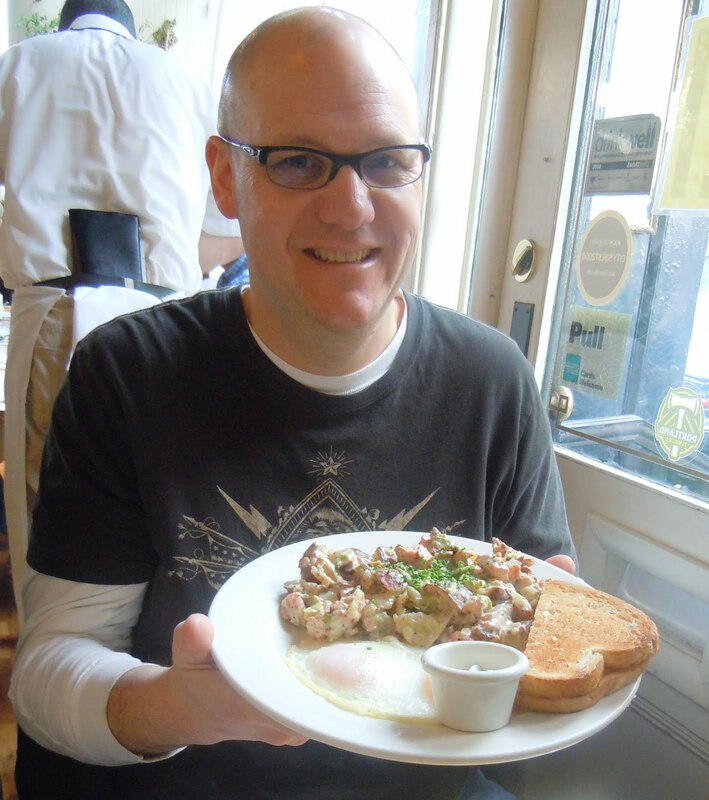 I opted for the Dungeness Crab Cake Eggs Benedict because I had ordered the Wild Salmon Hash on a previous hashcapade. So, today’s hashcapade supplicant, er, taster, was Cory, who does resemble Michael Pollan a bit! In a nutshell, I would say that everything came together without one ingredient dominating the others – all while forming a harmonious “one”. Spot on, mate, spot on! 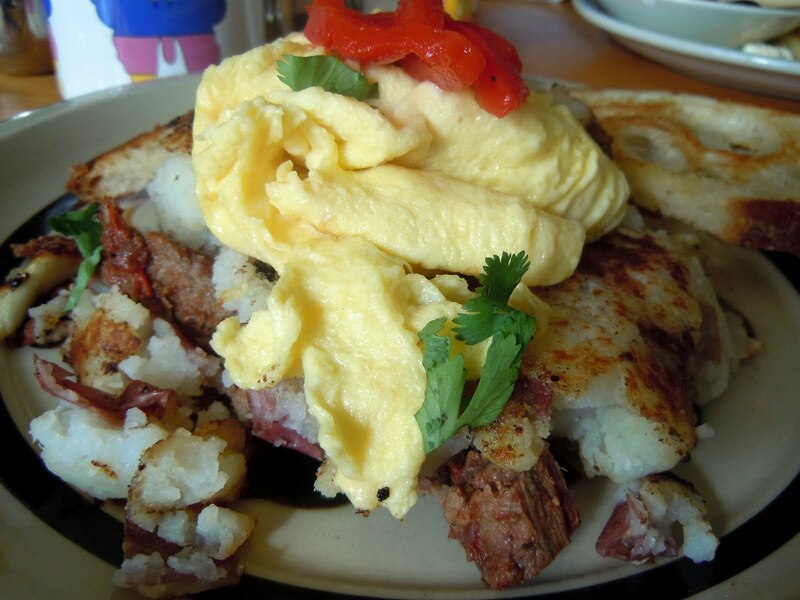 Tell me – what’s your favorite dish at Mother’s Bistro? Before my hash obsession, I often thought of making ravioli filled with savory Indian dishes – Chicken Curry (Murgh Karee), Butter Chicken (Murgh Makhani) or another favorite, Potatoes with Mustard Seeds (Sookhi Bhaji). My head was filled with day dreams of the exotic ravioli magnate I would become, that is until Ratatouille’s evil mini-chef, Skinner, stole my idea! Undeterred and now hash-manic, I kicked it into high gear to combine my love of Indian cuisine with a food ring presentation, inspired by last weekend’s stellar hashcapade at Hall Street Grill. Surely Madhur Jaffrey’s Sookhi Bhaji could anchor my culinary experiment at Chez Clark! Surprised to see the finished product so soon? I’m channeling Christoper Nolan, the superb director of, among many movies, Memento. Nolan sliced the movie into several 10-minute segments and then started the film with the start of the last segment and worked his way backward to the end…of the beginning. If you loved that show, leave a comment, backwards of course, and I’ll forget what you wrote until yesterday! So, down to business. What’s this concoction that Clark’s devised? What keeps it together? What is the chopped green stuff? Why did I just lick the screen? 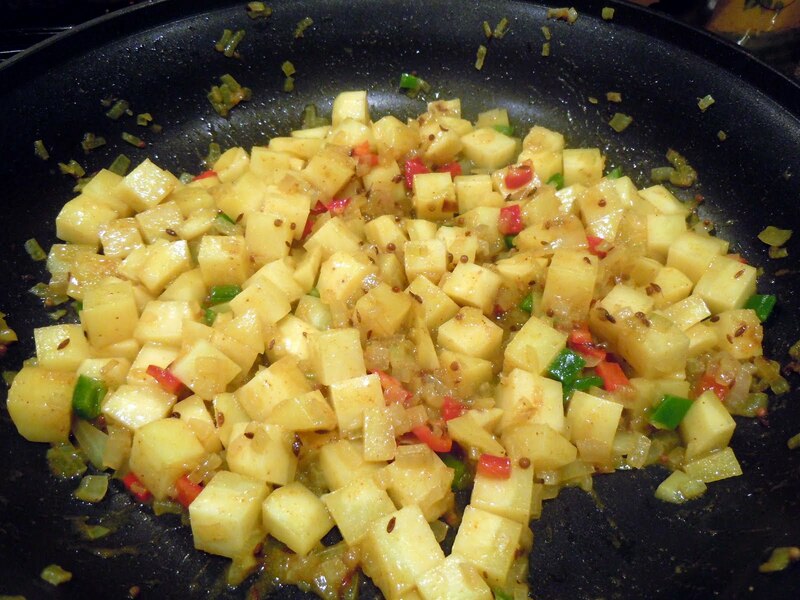 The foundation of the hash is the aforementioned Sookhi Bhaji or Potatoes with Mustard Seed. Be prepared to buy lots of spices as the list is rather long, but the flavors that develop are worth every penny! Buy Stock in Spice Islands Before Embarking on this Hashcapade! 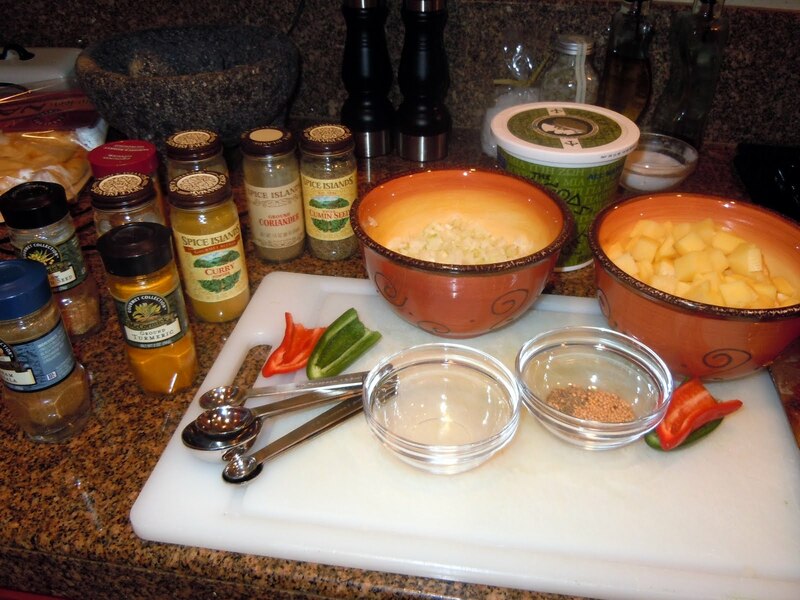 Basically, it starts with heating up some spices, tossing in onions, then more spices and potatoes. Then, I shredded some rotisserie chicken, added spices, combined with potatoes and cilantro, and added a curry yogurt mixture to bind. 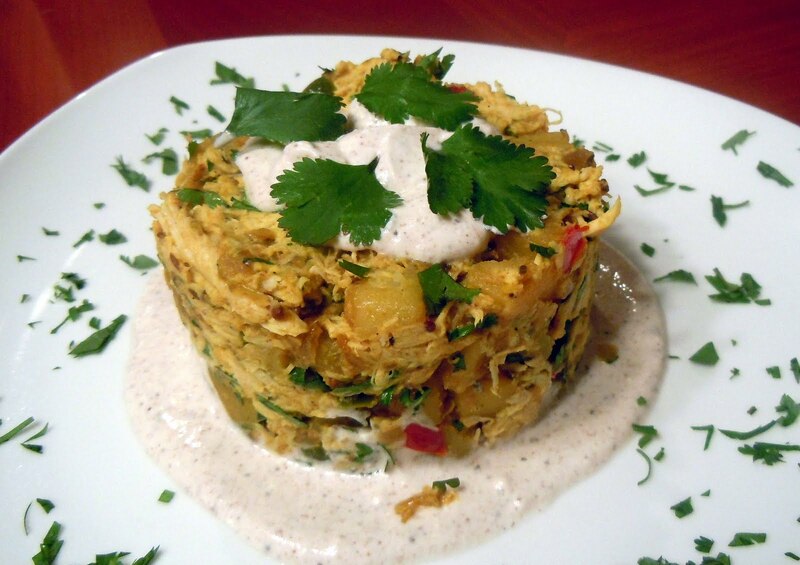 Finally, I plated with a garam masala yogurt mixture on the bottom, used a 4″ diameter, 2″ high food ring to pack in the hash and garnished with cilantro and more garam marsala yogurt. After several food fashion shots, I eagerly tried my first bite, keen to discern all the flavors. 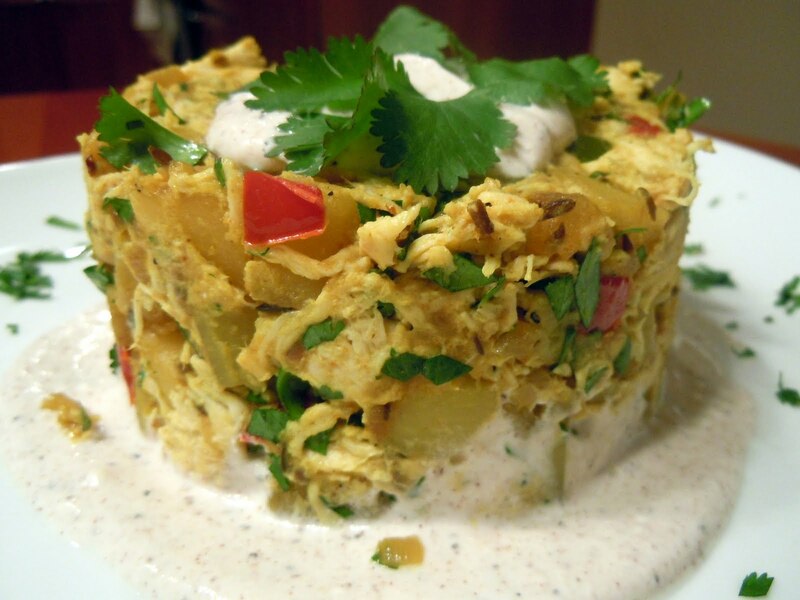 First came the creamy/tangy garam masala yogurt, followed by the cumin-cilantro flavor of the potatoes. Next came the classic curry powder flavor of the chicken, but with a surprising pop of sweet crunchy flavor from the crystallized ginger I had added. Wow! I hope you enjoy this as much as I did. Please send comments on your favorite Indian dishes and perhaps another delicious sub-continent hashcapade will ensue! I’m delighted to introduce Elizabeth Fuss, one of my twitter friends (@LizzyDishes), who graciously agreed to write this guest post! Her blog is already listed in my blog roll (Lizzy Dishes of Portland) because of her descriptive, artful and entertaining posts capturing her culinary adventures. Be sure to read here latest quest for the perfect use of duck eggs. Thank you, Liz!!! For my whole my life, until 2007, I didn’t eat seafood. It always tasted fishy and rubbery and smelled dreadfully unappealing. When I went with friends to seafood restaurants, I usually ordered a burger or some other type of non-seafood. 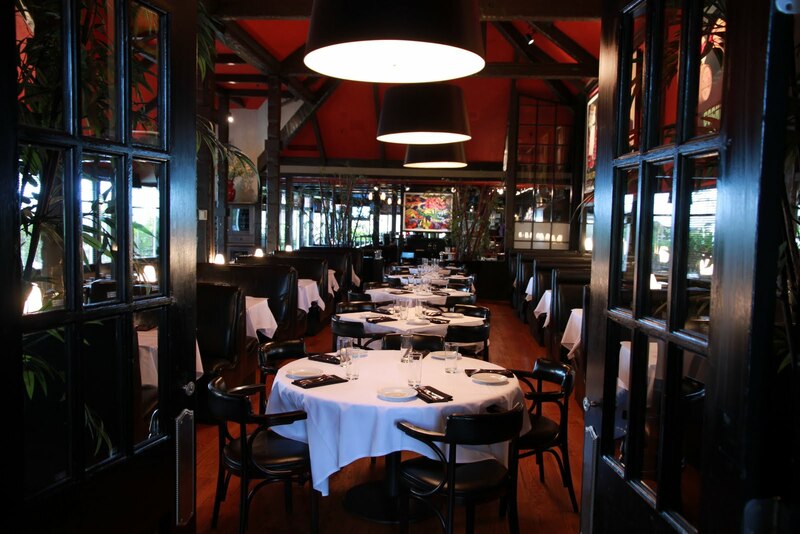 Then, some friends and I ate at Hall Street Grill in Beaverton one night in March of 2007. I remember it clearly – I ordered butternut squash ravioli. The super-enthusiastic waitress said that I must absolutely order prawns with the ravioli because they just made the dish. The prawns weren’t on the menu and I had no idea how much they cost, but the waitress – she was convincing. And oh what a delight. I remember thinking that the prawns, juicy and pink, tasted like little steaks. No fishiness, no rubbery texture. It was heaven. And that was my first amazing experience with seafood. And with Hall Street Grill. I don’t make it out to Beaverton too often. But when I heard that Hall Street Grill was going to start offering brunch, my heart flitted a bit. And then, delightfully, Mr. Hashcapade set up a blogger brunch/tweetup for Sunday Brunch at this very restaurant! Always eager to try new food and meet new people in the food/blogger/twitter community, I said yes. 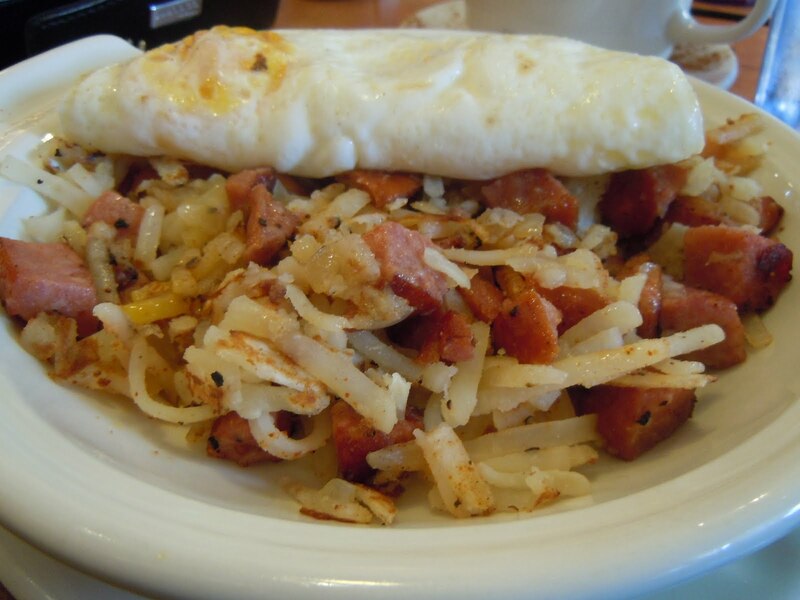 Amidst food talk and writing talk (my two favorite kinds of talk), I ordered the “Porkstrami” Hash. Clark ordered the Duck Confit Hash. Others at the table ordered both kinds of eggs benedict, aebleskivers and a frittata. The chef came out and talked with us, or rather with Paul Gerald, Mr. Breakfast in Bridgetown himself, and then brought us a complimentary order of aebleskivers (Danish pancakes) with Ginger Rhubarb compote, lemon curd and butter. The aebleskivers were chewy and dense and tasty with the lovely toppings. My hash was perfectly cooked and seasoned. There were hidden bits of caramelized onions peeking out beneath the salty, intensely flavorful pastrami. The potatoes were cooked well and everything melded together so that I couldn’t distinguish between the elements in my mouth. There was a Russian crème fraîche that got a little lost in the hash – I couldn’t taste it. I didn’t mind, though, because it tasted complete without it. This was only their second week doing brunch and I have no doubt the chef and delightful staff will continue to refine the dishes and produce stellar food. I love Hall Street Grill. That fond memory of my first ever prawn stands out in my head as one of my first great-food-appreciation moments. And now I have the hash to remember, too. Mmmm. Thanks for the hashcapade, Mr. Hashcapade! A final note of thanks to Mary Rarick, whose genius idea of having Liz write a guest post has opened a new frontier for me and, hopefully, my readers. Danke schön, ÜberMary! And to Executive Chef Travis who kindly sent photos after reading my note about my dead camera…that is service!! !